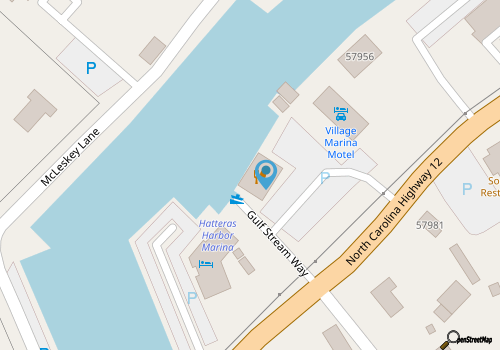 The Village Marina & Motel is an all-encompassing site where water lovers, mariners, fishermen, and anyone who’s in the mood for an on-the-water sunset and a meal can meet in the heart of Hatteras Village. Located close to Hatteras Inlet and the outlying Gulf Stream, the marina serves as a launching point for a number of local charter businesses, as well as visiting mariners who need a “home base” for inshore and offshore adventures. For nightly or more extensive stays, visitors can also stay at the on-site motel which features 12 suites that include a kitchenette with dishes and coffee maker, a flat screen TV, and ample room to relax after a day of on-the-water explorations. There’s also a Marina Store with everything anglers require for a full day of fishing, from gas and oil to bait and paper towels, as well as an on-site restaurant called Dinky’s which is seasonally open, and has incredible harbor and sound views (especially around sunset.) With everything under the sun that visitors require to fully enjoy life on the water, this Hatteras Village destination is a great find for mariners and everyday explorers alike. Dock, explore, stay, and dine without ever leaving a single island location at Village Marina & Motel.